The owner of the Funkydog cafe-restaurant called Anh is an artist and a painter as well. But when painting didn't bring him enough profit to support his wife and daughter, last year he decided to add a cafe and restaurant. In a dark past Anh used to be an addict and finally got a one year prison sentence, but was released after six months, because of the King's birthday. His life is now devoted to the King, so he says, and he likes to contribute to his family and customer's happiness. Most things in the shop have been designed and made by the artist himself, including the food. Anh created his own small "prison", so he said, where he can find happiness. Entering the shop brings you really into an esoteric atmosphere, not easily found elsewhere in Thailand. The menu is not large and Anh nor his wife had any prior experience in the 'hospitality industry', but the dishes are wonderful and cannot be found anywhere else. I took the yellow curry which was so delicious I took a second one. If you're in for a talk, Ahn is eager to explain his special live/business-style. The coffee is grown by local hill-tribes and freshly roasted, which he likes to do outside.Anh will never check the time needed for roasting, he will know when it's ready when passers-by start noticing the wonderful smell. Profit-making is not the main goal, but happiness is. 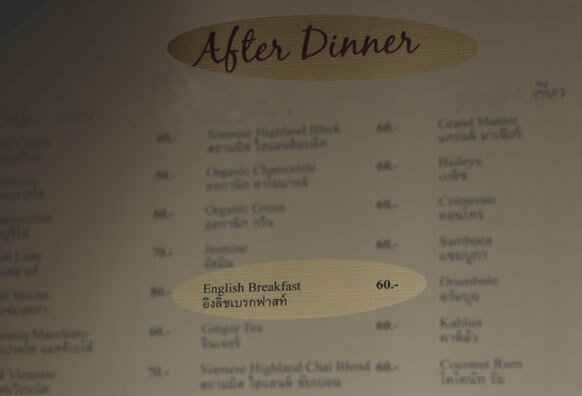 The most expensive dinner-item will cost you 80 Baht (€2,-/$2,55). If you're in for it, try the Mojito as well, again not your average Mojito, but an own invention. In the background you will hear no new-age music as you perhaps would expect, but Cuban/Latino music instead. In the Funkydog everything is surprising indeed. Seen on a menu in a restaurant in Chiang Mai. Expect to pay twice and the double of what Thai people pay before you get to see the Giant Panda's, but still, seeing a Panda for the first time, made my day. You have to walk around the central gold shrine three times to get lucky. To be even more lucky they have an ATM machine nearby and lots of boxes to put the money in. Far more profitable than the example below..
Foreigners have to pay 30 Baht (€0,75/$0.95) extra for the cable car. My argument that this was an illegitimate act according to UN resolutions, resulted in a vague smile only. Later I found out Thailand does not recognize competence for UN ICERD article 14, whereby individuals or groups can file a complaint. So there goes my case..
Another must, so they say, Thai pay 100 Baht (€2,50/$3.18), foreigners 400 Baht (€10,-/$12.70). Again the UN illegitimacy thing didn't work and telling them I was Thai didn't convince them either, but considering this government owned Thaksin mind spin makes big time losses anyway and taking such a long time to get there, I hesitantly agreed. Afterwards, if at all, I think it's better to go during day time, since no flash was allowed and if the animals didn't move, the bus did. In order to get break even they will need to earn 100 million bath/year, meaning 1100 tourist per day, with 50/50 Thai/Farang. I estimate to have seen a maximum of 300 visitors there that night, also a student who held an interview about the quality, confessed to me after 5 years it's still not profitable. There were talks about closing it down, which would probably be the best thing, but nobody in Chiang Mai would like to loose face. So it's here to stay for a lot of years more. A nice symbol for the tourist industry here, me being the prey. Coming to Chiang Mai, the're some touristic obligatitions which you need to see, before mentioning to other tourists you've been there. Below is an example of four of them. Please note: I'm not mentioning human zoo's, cultural exploitation, drugged or circus animals and so on. Having stayed in hotels around the world throughout my life I came across a similar list which has been around for a long time and thought it needed some updating. On the left a picture of the second worst room I stayed so far, which was in Holland. Dorm-room "Hey, pass me that joint"
1. The Big Buddha statue, which is an initiative of volunteers fully dependent on donations and still needs a long time to fully complete I guess. 2. A Windmill situated at the most Southern point of Phuket, where people say you can see the latest sunset of the country, but in fact the quite remote and inaccessible Similan Island group, is located more westwards than this landmark enabling you to see the very last sunset of the whole Kingdom. Today I bought a T-shirt on the mainland in Phuket from the brand KMOD. The label says "Genthentic brand". Is this an aggregation of the words Genuine and Authentic? Certainly the word "Genthentic" seems to be really very genthentic indeed, since Google will return with just one hit. Oh sorry, now it gets two hits, since I mentioned the same word here. Remember this brand, since they took care it has perrection in every detail as well. 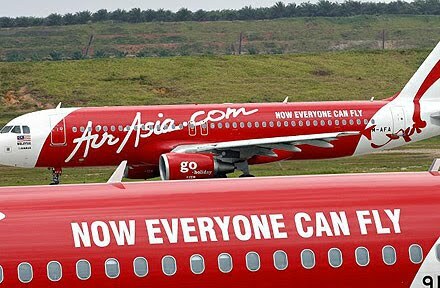 Today I booked a domestic flight with Air Asia and got a travel itinerary sent by email, nothing special, apart from the last sentence, which gives a whole new meaning to their slogan "Now everyone can fly"
Thank you for flying with AirAsia! We are pleased to confirm your booking and attached herewith please find your Itinerary. - AirAsia is strictly a point-to-point carrier and shall not be responsible for any connecting flight arrangement which you may choose to make. Purchase travel insurance to avoid financial hassles should you miss your connecting flight. - The LCC Terminal in Kuala Lumpur does not have any transit facilities for connecting guests. Please plan any connecting flights accordingly. - Our check-in counters are open two (2) hours before the scheduled flight departure time. The counters close forty five (45) minutes before the scheduled flight departure time. AirAsia flights to and from Australia, check-in counters open three (3) hours and closes sixty (60) minutes before the scheduled flight departure time. You must be in possession of a boarding pass by the time check in closes, or you will not be accepted for the flight. - Pre-book your Baggage Supersize (checked baggage) at a big discount and save time during check-in. Each checked baggage shall not exceed 32 kg. - Guests may not use the unused checked baggage weight and pieces of other guests u nless traveling on the same Itinerary. - Certain sporting equipment up to 15kg is subject to a Sports Equipment Fee per item per one way. - Pick a seat- avoid disappointment, pre-book the seat you want. - You are responsible in ensuring compliance with the immigration, custom or other legal requirements of the countries of your destination. Kindly ensure that for International destination you possess a valid passport with at least six (6) months' validity and the applicable valid visas. You shall also possess a return itinerary or ticket on an onward journey. - Guests are strongly advised not to check in goods which are valuable and fragile as baggage. If they are checked in as baggage, guests agree they send for carriage of such items at their own risk. - Our liabilities to you are limited, it is therefore recommended that you purchase travel insurance. - Guests can no longer carry guns and/or ammunition on flights to or from Indonesia. Carry guns and/or ammunition on flights? Does this imply that in the past people were allowed to carry loaded guns on Indonesia flights? And no problem to carry a gun when flying to other countries, potentially enabling travelers to take over the cockpit and choose their own destination? "Please note that the use off all electronic devices and ammunition is forbidden during take-off and landing. For your own safety, please refrain from shooting until the fasten seatbelt sign has been switched off." As a matter of fact the footer on their website is becoming to look a bit suspicious too.. Hoping to add something useful to the unfinished list of '200' things you didn't know about Thailand, I felt the urge to submit my own contribution. 1. The old name for Bangkok is the longest name of any place in the world namely: "Krung Thep Mahanakhon Amon Rattanakosin Mahinthara Ayuthaya Mahadilok Phop Noppharat Ratchathani Burirom Udomratchaniwet Mahasathan Amon Piman Awatan Sathit Sakkathattiya Witsanukam Prasit". In the official English romanisation, this is certified as the longest place name in the world in the Guinness book of records, meaning: "The city of angels, the great city, the residence of the Emerald Buddha, the impregnable city (of Ayutthaya) of God Indra, the grand capital of the world endowed with nine precious gems, the happy city, abounding in an enormous Royal Palace that resembles the heavenly abode where reigns the reincarnated god, a city given by Indra and built by Vishnukarn". Thai school children are obliged to learn the name by heart, but if you would use it to buy a train ticket for example, the train would probably already have left. 2. Also named the king of invention, in 1993 King Bhumipol became the world’s first monarch to be granted a patent. The patent was issued for an aerator used in wastewater treatment, after that he was granted several other patents concerning water treatment and rainmaking. 3. If we may believe Forbes magazine, as of 2008 King Bhumipol is the richest monarch in the world, surpassing the sultan of Brunei. According to Forbes in that year his possessions were being estimated to be worth $35b. 4. Thailand is the only country in East-Asia to have never been colonized. Although during WWII they were outranked by Japanese troops resulting in a collaboration pact whereby the government remained intact, they refused to declare war on Britain and America, however people were being maltreated by the Japanese during this time, amongst other during the construction of the infamous death railway between Bangkok and Rangoon, Myanmar. - Korea: Has been colonised by the Mongols from 1231 till 1270, by Japan from 1592 till 1598 and 1910 till 1945. South Korea has a major military presence by the US from 1950 till now. - Japan: Was occupied only once by the allied troops led by the US from 1945 till 1952 and similarly to South Korea, US military never left. - China: Besides British influence and partly being occupied by Japan in WWII in the aftermath being defeated by the Russians, China has once been fully colonised for more than a century by the Mongols from 1294 till 1420. 5. Thailand is the only country to have separate toilets for effeminate gays/ladyboys in schools. Where do masculine lesbians/tomboys go on? 6. Isan which occupies 20 9 provinces of Thailand, accommodating almost 1/3 of the population, has a different mother tongue than Thai. Instead Isan language is a dialect of the Lao-language. Some older people are able to speak Isan language only. So before you start learning Thai, think twice, does your partner happens to come from Isan or you like to be the center of attention in lady-bars? Better learn Isan. It's great for your holidays in Laos too. Learn one get two. 7. 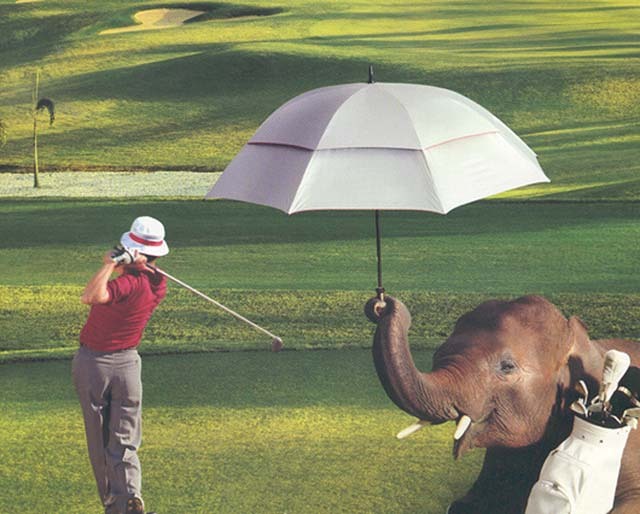 The inventor of Red Bull is a Thai, currently the richest entrepeneur of Thailand, after Thaksin left. 8. Roi-Et city and Roi-Et province in Isan are the only city/province in the world which represent solely a number, namely 101. 9. Thailand does not have 75 or 76 provinces anymore, as of of August 3rd, 2010 Bung Kan has been officially declared the 77th province of Thailand or the 20th province of Isan. 10. What's the capital of Bung Kan? Easy. All capital cities of the Thai provinces share the same name as the province itself. Living fully monogamous throughout their life, hornbills are also known as the birds of love. This is a scene I photographed today on Coral Island..
"Shall we take this suite, dear? It looks very romantic"
"What you mean? Too expensive.. This is once in a lifetime!" "Okay honey, calm down, you know that I will love you forever, we take it!" What should I leave in the tip box for the assistant receptionists here? Some dried cat food perhaps?